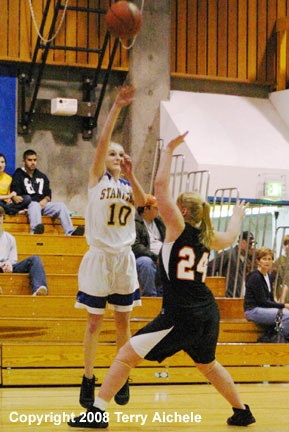 Stanfield senior Mikayla Baros sets up to shoot a freethrow. STANFIELD - The Stanfield Tigers hosted Wallowa County in an afternoon game on Saturday, December 6, 2008. The Tigers won 39-24 after pulling away in the third quarter. Up to that point it had been a very tight game. The first quarter started slowly and ended up tied at 4-4. Both teams started scoring in the second quarter with Stanfield leading 16-15 at halftime. 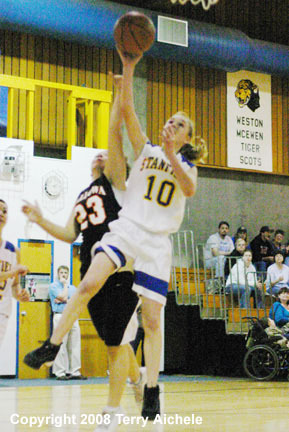 Wallowa was held to only scoring four points in the third quarter while Stanfield scored 13 points to take a 29-19 lead. 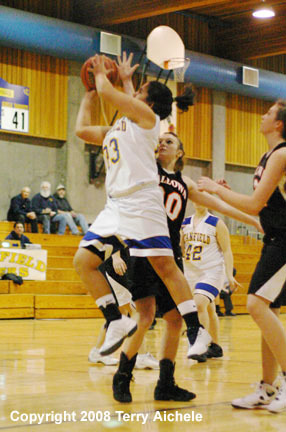 Stanfield scored ten points in the fourth while holding Wallowa to five. Stanfield won 39-24. Stanfield had nice play by Jessenia Carrillo, Mikayla Baros and Erica Gerhke. LEFT - Erica Gerhke of Stanfield takes a shot during the game on Saturday. 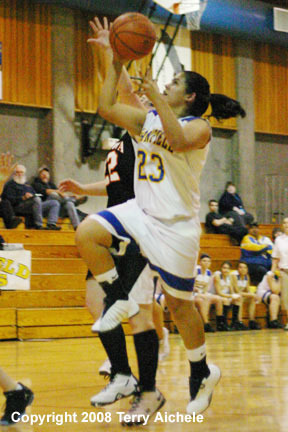 RIGHT - Jessenia Carrillo of Stanfield drives to the basket for a layup. 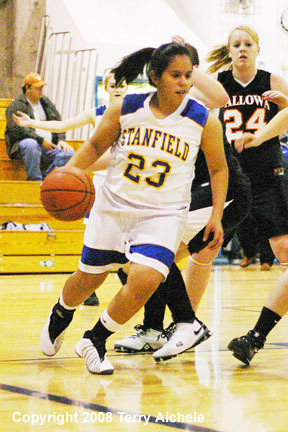 LEFT - Jessenia Carrillo of Stanfield dribbling the ball. 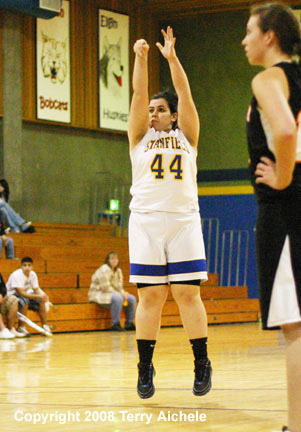 RIGHT - Jessenia Carrillo of Stanfield takes a shot. 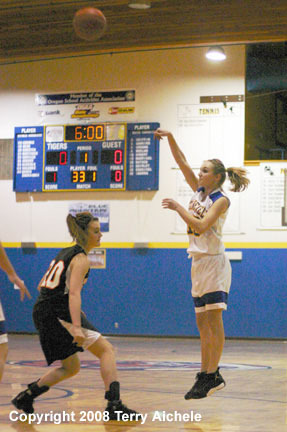 LEFT - Mikayla Baros of Stanfield shoots a freethrow during the game on Saturday. 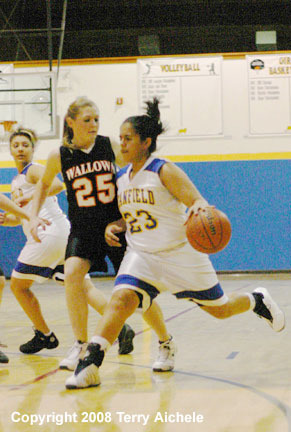 RIGHT - Jessenia Carrillo of Stanfield works her way around a Wallowa defender. 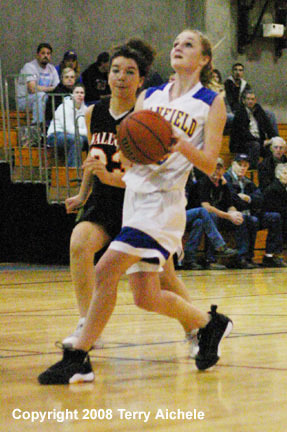 LEFT - Erica Gerhke of Stanfield takes a shot during the game on Saturday. 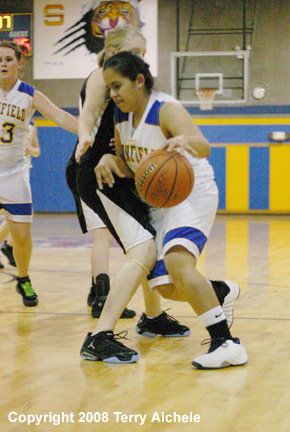 RIGHT - Jessenia Carrillo of Stanfield drives along the baseline during the game on Saturday. Erica Gerhke of Stanfield drives to the basket for a layup during the game on Saturday.